To assess and analyze the impact of setup uncertainties on target volume coverage and doses to organs at risk (OAR) in head and neck cancer (HNC) patients treated by image-guided radiotherapy (IGRT). Translational setup errors in 25 HNC patients were observed by kilovoltage cone beam computed tomography (kV CBCT). Two plans were generated. Plan one – the original plan which was the initially optimized and approved plan of the patient. All patients were treated according to their respective approved plans at a defined isocenter. Plan two – the plan sum which was the sum of all plans recalculated at a different isocenter according to setup errors in x, y, and z-direction. 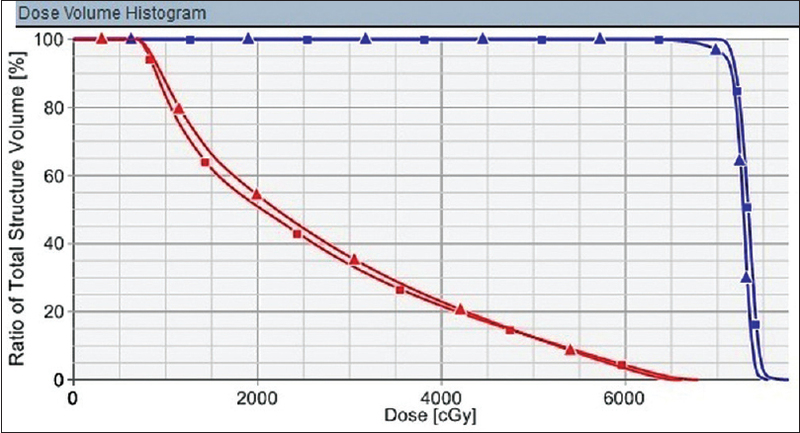 Plan sum was created to evaluate doses that would have been received by planning target volume (PTV) and OARs if setup errors were not corrected. These 2 plans were analyzed and compared in terms of target volume coverage and doses to OARs. A total 503 kV CBCT images were acquired for evaluation of setup errors in 25 HNC patients. The systematic (mean) and random errors (standard deviation) combined for 25 patients in x, y, and z directions were 0.15 cm, 0.21 cm, and 0.19 cm and 0.09 cm, 0.12 cm, and 0.09 cm, respectively. The study showed that there was a significant difference in PTV coverage between 2 plans. The doses to various OARs showed a nonsignificant increase in the plan sum. The correction of translational setup errors is essential for IGRT treatment in terms of delivery of planned optimal doses to target volume. 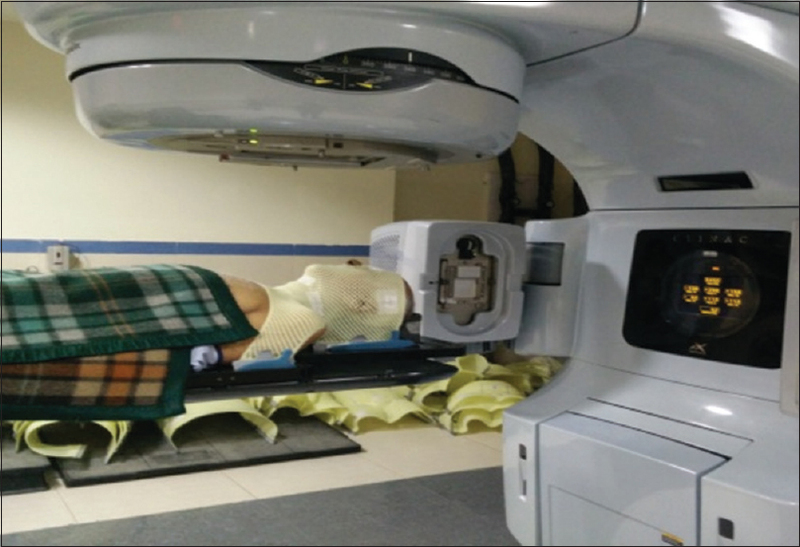 Patient positioning and immobilization during radiotherapy planning and treatment are of utmost importance, especially in the execution of conformal techniques of radiotherapy. Intensity modulated radiotherapy (IMRT) technique allows delivery of steep dose gradients, respecting the normal tissue tolerances in head and neck cancer (HNC) patients. Image-guided radiotherapy (IGRT) is a step further to IMRT using modern imaging modalities for adjusting target motion and positional uncertainties. The margin from clinical target volume (CTV) to planning target volume (PTV) accounts for uncertainties such as target shape, organ motion, and patient setup errors. The patient setup at each radiotherapy treatment is affected by various setup uncertainties such as variations in patient positioning, mechanical uncertainties of the equipment (sagging of gantry, collimators, and couch), dosimetric uncertainties, transfer set-up errors from computed tomography (CT) simulator to the treatment unit, and human factors. These setup uncertainties constitute systematic error, i.e., mean and random errors, i.e., standard deviation (SD). Many studies have dealt with translational setup errors ,,, and a few with rotational setup errors,,, and defined the margin from CTV to PTV. Some of these have reported the impact of these errors, if not corrected, on target volume coverage and doses to organs at risk (OAR).,, The current study was undertaken to quantify translational setup errors in the treatment of HNC patients by IGRT. We also aimed at analyzing the impact of these errors, if not corrected, on the target volume coverage and doses to OARs, and comparing these parameters with the initially optimized plan of the patient. This was a single-institutional prospective study in which 25 HNC patients were recruited from November 2014 to April 2015, undergoing definitive radiotherapy by IGRT technique. 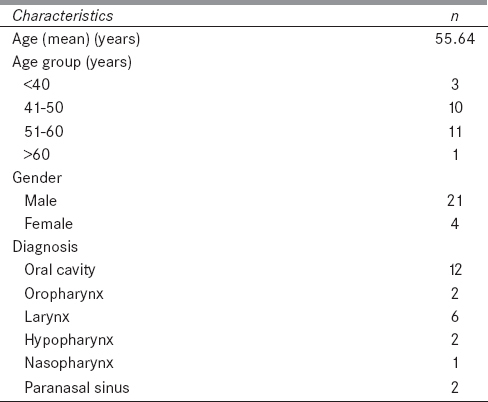 Patient- and disease-related characteristics are shown in [Table 1]. Patients were simulated supine on an all in one base plate and immobilized with a head, neck, and shoulder Orfit thermoplastic ray ordinary cast. Radiotherapy planning CT scan was acquired on CT simulator (Siemens, SOMATOM Sensation open - 40 slices) with 3 mm slice thickness with intravenous contrast. The CT images were transferred to the SomaVision v10 treatment planning system (Varian Medical System, Palo, Alto, CA). Target volumes: Gross tumor volume (GTV), CTV, PTV, and OARs, for example, spinal cord, parotids, cochlea, eyes, optic nerves, optic chiasma, mandible, and brainstem were delineated and contoured by radiation oncologist on planning software SomaVision v10 (Varian Medical System, Palo, Alto, CA). Three dose level CTVs were contoured depending on the risk of harboring disease; CTV 1, CTV 2, and CTV 3. CTV 1 was defined as GTV with an added margin of 0.5 cm. CTV 2 was defined as the region encompassing CTV 1 and regions adjacent to it deemed at harboring subclinical disease but at high-risk. Generous margin from CTV 2 was used based on the pattern of spread of primary and adjacent nodal levels. CTV 3 was defined as the region encompassing elective nodal regions which are at low risk (prophylactically treated neck). A 5 mm margin was taken for defining PTV1, PTV2, and PTV3 from CTV1, CTV2, and CTV3, respectively. PTV1, PTV2, and PTV3 were prescribed 66–70 Gy, 63 Gy, and 56 Gy in 35 fractions, respectively. For every patient, after optimization and detailed plan evaluation, IGRT plan was implemented on treatment machine Clinac ® iX (Varian Medical System, Palo, Alto, CA). For setup verification, daily imaging for the first 5 days of treatment and thereafter twice weekly imaging were done for the rest of the treatment sessions. For three-dimensional (3D) matching, the setup verification kilovoltage cone beam CT (kV CBCT) images were acquired using Varian On Board Imager integrated in Clinac ®-iX medical linear accelerator (Varian Medical Systems, Alto, CA). Setup errors were determined by considering each patient as rigid body model. For 3D-3D match, CBCT was volumetrically fused to reference CT images in axial, sagittal, and coronal planes using 3D registration algorithm. All 3D-3D matchings were done with manual registration using a defined procedure using Aria online review software. Manual matching was also done utilizing bony landmarks such as skull base, nasal septum, cervical vertebral bodies, and spinous processes [Figure 1] and [Figure 2]. The displacement of portal image from the reference image was recorded in x (lateral), y (longitudinal), and z (vertical) direction. At the end of the treatment of a patient, systematic setup error (mean error) and random error (SD) were calculated. ”Original plan” was the initial optimized plan of the patient, approved by treating radiation oncologist. All patients were treated with their respective approved original plans at a defined isocenter. Another plan named “plan sum” was generated which was the sum of all plans recalculated at different isocenter depending on setup uncertainties in x, y, and z-direction (isocenter was shifted according to shifts obtained and optimization was done). For treatment sessions when no imaging was done, patient's average setup error was used for plan sum calculation. These two plans were analyzed and compared with respect to TV coverage and OARs doses. Various parameters used to evaluate the target volume coverage were-Dx% (dose to which x% of TV is irradiated), where D98%, D95%, D50%, and D2% for PTV1, PTV2, and PTV3. OARs were evaluated as per the QUANTEC guidelines. To illustrate the magnitude of setup error values absolute values of errors were considered for calculation. Statistical analysis was performed using paired t-test for comparison between normally distributed continuous variables. All statistical computations were carried out using Statistical Package for the Social Sciences version 20.0 (SPSS version 20, SPSS Inc, Chicago, IL, USA). A P< 0.05 was considered statistically significant. 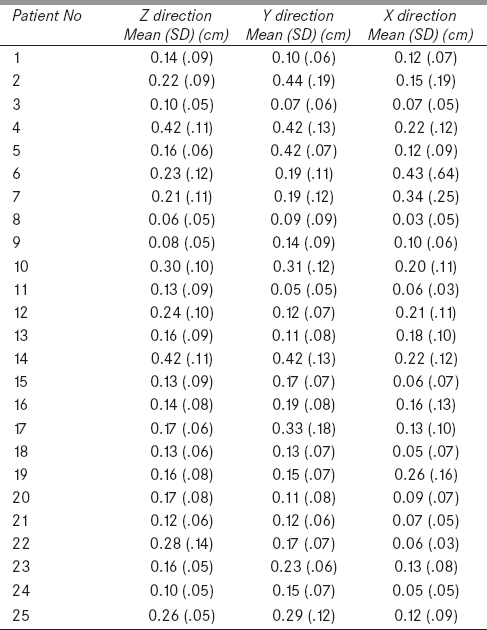 A total of 503 kV CBCT images were acquired for evaluation of translational setup errors in 25 HNC patients [Table 2]. The systematic and random errors for the population of 25 patients in x, y, and z directions were 0.15 cm, 0.21, cm and 0.19 cm and 0.09 cm, 0.12 cm, and 0.09 cm, respectively. Maximum and minimum error in x, y, and z directions were 0.43, 0.44, 0.42 cm and 0.03, 0.05, and 0.06 cm, respectively. Utilizing formula given by van Herk et al., the margin from CTV to PTV in x, y, and z directions in our study are 0.43 cm, 0.61, cm and 0.54 cm, respectively, to cover 95% CTVs in 90% of patients. 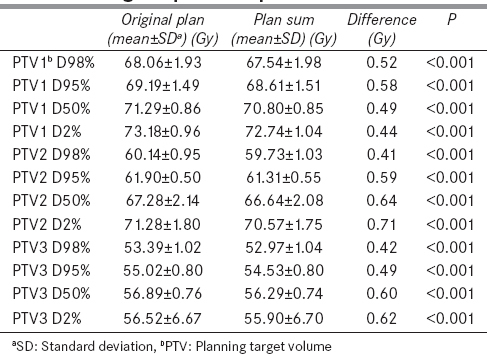 The dose coverage was significantly higher in the original plan than the plan sum for D98%, D95%, D50%, and D2% for each level of PTV-PTV1, PTV2, and PTV3 [Table 3]. 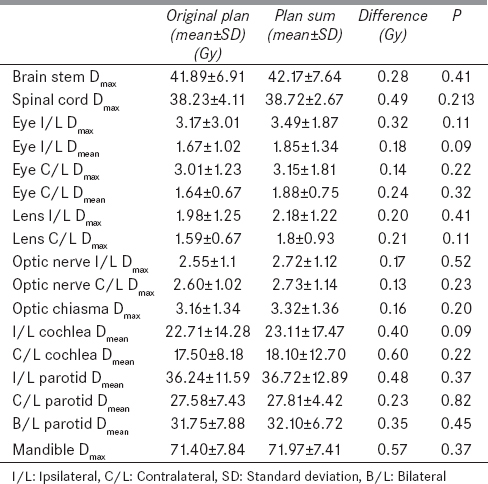 However, the doses received by OARs were not statistically significant between the two plans [Table 4]. [Figure 3] depicts the dose volume histogram of a patient comparing Plan sum and Original plan for PTV and Parotid gland. [Figure 4] shows the Color wash dose distribution for a patient. IGRT, especially with the advent of volumetric imaging by CBCT, is an excellent tool to correct the setup errors and increase the precision and validity of treatment delivery. It requires a high degree of precision and accuracy from radiation oncologists (target volume and OARs delineation), physicist (plan optimization), and radiotherapy technicians (treatment delivery) for its successful implementation. The delivery of such precision treatment mandates the need for narrowing the broad field margins, as used in conventional treatment, to few millimeters margin for conformal treatment delivery. It also requires appropriate immobilization and positioning of the patient on the treatment couch, familiarity with imaging tools, and vigilance in correcting the setup errors. There are several publications addressing the issue of set-up uncertainties in HNC. Xu et al. observed that translational setup errors in x, y, and z directions were 1.2 ± 0.9 mm, 1.2 ± 1.1 mm, and 1.0 ± 0.8 mm, respectively. Allen et al. reported that setup variations vary within 3 mm in head and neck patients. Hurkmans et al. in a review article stated that SDs of the systematic and random setup errors varies, respectively, between 1.6–4.6 mm and 1.1–2.5 mm in HNC. The observed systematic and random errors in our study in x, y, and z directions were 0.15, 0.21, and 0.19 cm and 0.09, 0.12, and 0.09 cm, respectively, in line with these studies. Our study showed that the setup uncertainties if left uncorrected would result in significant decrease in target volume coverage and nonsignificant increase in doses to OARs, which might result in inferior tumor control and increased normal tissue toxicity. Duma et al. too assessed the impact of setup uncertainties on parotid gland with a nonsignificant P value. This necessitates the need for acquiring images and correcting setup errors to avoid underdosing of target volumes and unforeseen excess dose delivery to OARs and hence, fulfill the purpose of IGRT in HNC patients. The limitations of this study are that only bone to bone matching was done, and rotational setup errors were not analyzed. Patient's weight loss and tumor shrinkage were not taken into account. Detection and correction of setup uncertainties are important for the precise delivery of radiotherapy treatment. IGRT by CBCT helps in reducing uncertainties to a large extent. This may ensure adequate and accurate dose delivery to target volumes and sparing of OAR. Manning MA, Wu Q, Cardinale RM, Mohan R, Lauve AD, Kavanagh BD, et al. The effect of setup uncertainty on normal tissue sparing with IMRT for head-and-neck cancer. Int J Radiat Oncol Biol Phys 2001;51:1400-9. Xu F, Wang J, Bai S, Xu QF, Shen YL, Zhong RM. Interfractional and intrafractional set up errors in radiotherapy for tumours analysed by cone- beam computed tomography. Chin J Cancer 2008;27:1111-6. Hurkmans CW, Remeijer P, Lebesque JV, Mijnheer BJ. Set-up verification using portal imaging; review of current clinical practice. Radiother Oncol 2001;58:105-20. Li XA, Qi XS, Pitterle M, Kalakota K, Mueller K, Erickson BA, et al. Interfractional variations in patient setup and anatomic change assessed by daily computed tomography. Int J Radiat Oncol Biol Phys 2007;68:581-91. 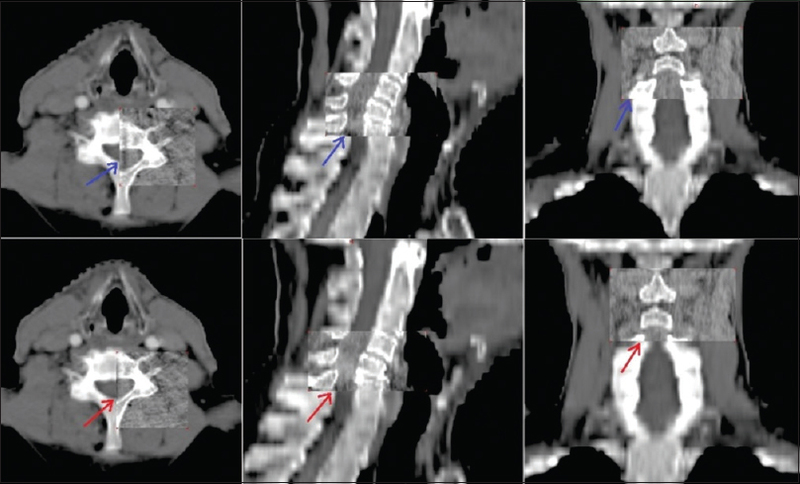 Guckenberger M, Meyer J, Vordermark D, Baier K, Wilbert J, Flentje M. Magnitude and clinical relevance of translational and rotational patient setup errors: A cone-beam CT study. Int J Radiat Oncol Biol Phys 2006;65:934-42. Fu W, Yang Y, Yue NJ, Heron DE, Saiful Huq M. Dosimetric influences of rotational setup errors on head and neck carcinoma intensity-modulated radiation therapy treatments. Med Dosim 2013;38:125-32. Kim GY, Pawlicki T, Le QT, Luxton G. Linac-based on-board imaging feasibility and the dosimetric consequences of head roll in head-and-neck IMRT plans. Med Dosim 2008;33:93-9.
van Herk M, Remeijer P, Rasch C, Lebesque JV. The probability of correct target dosage: Dose-population histograms for deriving treatment margins in radiotherapy. Int J Radiat Oncol Biol Phys 2000;47:1121-35. Marks LB, Yorke ED, Jackson A, Ten Haken RK, Constine LS, Eisbruch A, et al. Use of normal tissue complication probability models in the clinic. Int J Radiat Oncol Biol Phys 2010;76 3 Suppl: S10-9. Den RB, Doemer A, Kubicek G, Bednarz G, Galvin JM, Keane WM, et al. Daily image guidance with cone-beam computed tomography for head-and-neck cancer intensity-modulated radiotherapy: A prospective study. Int J Radiat Oncol Biol Phys 2010;76:1353-9. Duma MN, Kampfer S, Wilkens JJ, Schuster T, Molls M, Geinitz H. Comparative analysis of an image-guided versus a non-image-guided setup approach in terms of delivered dose to the parotid glands in head-and-neck cancer IMRT. Int J Radiat Oncol Biol Phys 2010;77:1266-73.